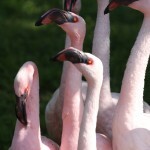 Lesser flamingos are found primarily in eastern and southern Africa. They feed by holding their head upside down over the surface of the water and filtering small bits of algae, diatoms, and small invertebrates through their beak. They get their coloration from pigments in their food. Conservation Status: With fairly stable numbers in the wild, lesser flamingo populations are not at risk. Flamingos are very social birds. In some areas of Africa, lesser flamingos will congregate in flocks of up to one million birds!